with the eigenvector . This is just the electrostatic plasma wave that we found previously in an unmagnetized plasma. This mode is longitudinal in nature, and, therefore, causes particles to oscillate parallel to . It follows that the particles experience zero Lorentz force due to the presence of the equilibrium magnetic field, with the result that this field has no effect on the mode dynamics. and the eigenvector . This is evidently a left-handed circularly polarized wave. At low frequencies (i.e., ), both waves convert into the Alfvén wave discussed in the previous section. (The fast and slow Alfvén waves are indistinguishable for parallel propagation.) Let us now examine the high-frequency behavior of the right- and left-handed waves. For the right-handed wave, because is negative, it is evident that as . This resonance, which corresponds to , is termed the electron cyclotron resonance. At the electron cyclotron resonance, the transverse electric field associated with a right-handed wave rotates at the same velocity, and in the same direction, as electrons gyrating around the equilibrium magnetic field. Thus, the electrons experience a continuous acceleration from the electric field, which tends to increase their perpendicular energy. It is, therefore, not surprising that right-handed waves, propagating parallel to the equilibrium magnetic field, and oscillating at the frequency , are absorbed by electrons. Above this frequency, the wave propagates once again. Figure 5.1: Schematic diagram showing the dispersion relation for a right-handed wave propagating parallel to the magnetic field in a magnetized plasma. The dispersion curve for a right-handed wave propagating parallel to the equilibrium magnetic field is sketched in Figure 5.1. 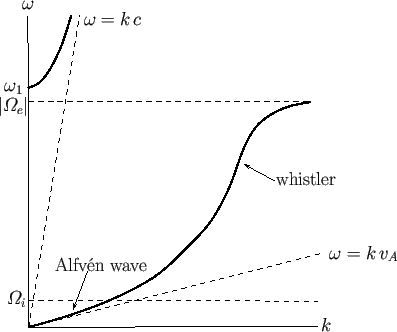 The continuation of the Alfvén wave above the ion cyclotron frequency is called the electron cyclotron wave, or, sometimes, the whistler wave. The latter terminology is prevalent in ionospheric and space plasma physics contexts. The wave that propagates above the cutoff frequency, , is a standard right-handed circularly polarized electromagnetic wave, somewhat modified by the presence of the plasma. The low-frequency branch of the dispersion curve differs fundamentally from the high-frequency branch, because the former branch corresponds to a wave that can only propagate through the plasma in the presence of an equilibrium magnetic field, whereas the latter branch corresponds to a wave that can propagate in the absence of an equilibrium field. The curious name ``whistler wave'' for the branch of the dispersion relation lying between the ion and electron cyclotron frequencies is originally derived from ionospheric physics. Whistler waves are a very characteristic type of audio-frequency radio interference, most commonly encountered at high latitudes, which take the form of brief, intermittent pulses, starting at high frequencies, and rapidly descending in pitch. Clearly, the low-frequency components of a pulse propagate more slowly than the high-frequency components. It follows that, by the time a pulse returns to ground level, it has been stretched out temporally, because its high-frequency components arrive slightly before its low-frequency components. This also accounts for the characteristic whistling-down effect observed at ground level. The shape of whistler pulses, and the way in which the pulse frequency varies in time, can yield a considerable amount of information about the regions of the Earth's magnetosphere through which the pulses have passed. For this reason, many countries maintain observatories in polar regions--especially Antarctica--which monitor and collect whistler data. As before, the lower branch in Figure 5.2 describes a wave that can only propagate in the presence of an equilibrium magnetic field, whereas the upper branch describes a wave that can propagate in the absence an equilibrium field. The continuation of the Alfvén wave to just below the ion cyclotron frequency is generally known as the ion cyclotron wave.